Once the temperature plummets to below 32 degrees, snow begins to pile up on the roofing system. It can grow to be several feet thick until its weight is too much for the load-bearing capacity of your roof. How do you know when there is too much weight? Listen for cracking sounds, openings above your windows and doors, or a bowed ceiling. If you do nothing, the roof could collapse around you. The result is damage in the building in the dead of winter. If you find anything wrong with your roof, you should call us. We can repair small issues before they turn into costly repairs. 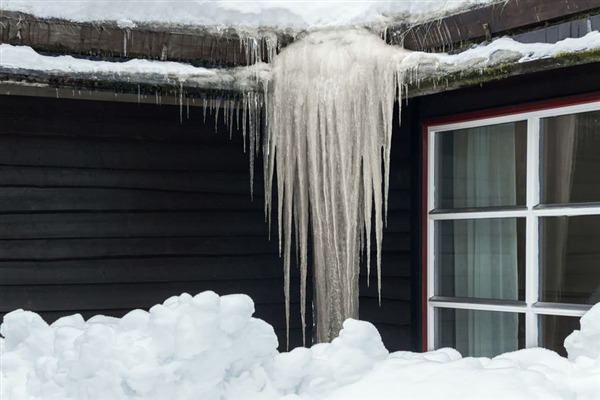 Ice dams may develop up along the eaves of your home, as snowmelt runs down to the roof's edges and refreezes. This ice dam effect may block your gutters and prevent water from draining off the roof. Once this occurs, your home is now a safety hazard, and your roof could buckle underneath the weight of the ice. Intelligent Design can send a professional crew out to safely and efficiently remove the ice without damaging the roof or putting anyone in harm’s way. Water is just as destructive in the winter as it is in the summer. Just because it doesn’t freeze doesn’t mean it doesn’t leak through your roofing system. We recommend contacting one of our roofing contractors to inspect your roof so that when the snow melts, there will be no leaks. Since ice and snow have a way of creating cracks or holes in the roofing material, an inspection could reveal if there is any damage or any water is leaking inside the building. If you haven’t called a roofing company to inspect your roof lately, the time is now. Contact Intelligent Design to evaluate your roof and make the necessary repairs. In addition to ice dam removal and roof repair, we also fix hail damaged roofs. Our services extend to residential roofing and commercial roofing. To schedule an inspection, call us at 763-315-0745, or you can message us on our contact page. We provide complete service for property owners in Minneapolis and St. Paul, Minnesota.